The National Association for Stock Car Auto Racing (NASCAR) is an American auto racing sanctioning and operating company that is best known for stock-car racing. Its three largest or National series are the Monster Energy NASCAR Cup Series, the Xfinity Series, and the Gander Outdoors Truck Series. Regional series include the NASCAR K&N Pro Series East and West, the Whelen Modified Tour, NASCAR Pinty's Series, NASCAR Whelen Euro Series, and NASCAR PEAK Mexico Series. NASCAR sanctions over 1,500 races at over 100 tracks in 48 US states as well as in Canada, Mexico, and Europe. NASCAR has presented races at the Suzuka and Motegi circuits in Japan, and the Calder Park Thunderdome in Australia. NASCAR also ventures into eSports via the PEAK Antifreeze NASCAR iRacing Series and a sanctioned ladder system on that title. NASCAR was founded by William France, Sr. on February 21, 1948 with the help of several other drivers of the time. The points system was written on a bar room napkin. The original plans for NASCAR included three distinct divisions: Modified, Roadster, and Strictly Stock. The Modified and Roadster classes were seen as more attractive to fans. It turned out that NASCAR fans wanted nothing to do with the roadsters, which fans perceived as a Northeast or Midwest series. The roadster division was quickly abandoned, while the modified division now operates as the NASCAR Whelen Modified Tour. The Strictly Stock division was put on hold as American automobile manufacturers were unable to produce family sedans quickly enough to keep up with post-World War II demand. The 1948 schedule featured 52 Modified dirt track races. The sanctioning body hosted its first event at Daytona Beach on February 15, 1948. Red Byron beat Marshall Teague in the Modified division race. Byron won the 1948 national championship. Things had changed dramatically by 1949, and the Strictly Stock division was able to debut with a 20-mile (32 km) exhibition in February near Miami. The Cup Series had its first title sponsor in 1972. R. J. Reynolds Tobacco Company, which had been banned from television advertising, found a popular and demographically suitable consumer base in NASCAR fans and engaged NASCAR as a promotional outlet. As a result of that sponsorship, the Grand National Series became known as the Winston Cup Series starting in 1971,  with a new points system and some significant cash benefits to compete for championship points. In 1972, the season was shortened from 48 races (including two on dirt tracks) to 31. 1972 is often acknowledged as the beginning of NASCAR's "modern era". The next competitive level, called Late Model Sportsman, gained the "Grand National" title passed down from the top division and soon found a sponsor in Busch Beer. In 2004, Nextel Communications took over sponsorship of the premier series from R. J. Reynolds, who had sponsored it as the Winston Cup from 1972 until 2003, and formally renamed it the Nextel Cup Series. A new championship points system, the " Chase for the Nextel Cup," (renamed "Chase for the Sprint Cup" in 2008) was also developed, which reset the point standings with ten races to go, making only drivers in the top ten or within 400 points of the leader eligible to win the championship. 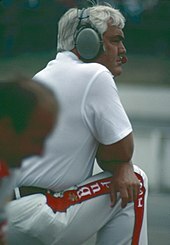 In 2007, NASCAR announced it was expanding "The Chase" from ten to twelve drivers, eliminating the 400-point cutoff, and giving a ten-point bonus to the top twelve drivers for each of the races they have won out of the first 26. Wins throughout the season would also be awarded five more points than in previous seasons. In 2008, the premier series title name became the Sprint Cup Series, as part of the merger between Nextel and Sprint. Monster Energy became the title sponsor in 2017, which changed the series' name to Monster Energy NASCAR Cup Series. With Monster Energy's title sponsorship, NASCAR also abandoned "The Chase" name and now refers to the last 10 races simply as "the playoffs" similar to most other sports. Beginning in 2010, the Nationwide cars adapted somewhat to the current " Car of Tomorrow" (or COT) design used by Cup cars, with different bodies from the Cup Series. In 2016, the Chase format was extended to both the Xfinity and Truck Series. Instead of the four-round, 10-race format used in the Cup Series, the Chase in each of the two supporting series consists of three rounds and seven races in all, with each preliminary round consisting of three races. The Xfinity Series Chase involves 12 drivers instead of the 16 participating in the Cup Series Chase. Four drivers are eliminated at the end of each preliminary round of the Chase in the Xfinity Series, which also mirrors the Cup Series Chase. This means that four drivers are eligible for the series title entering the final race, as in the Cup Series. Similar to Cup, starting in 2017 "The Chase" moniker was dropped and the final seven races are now referred to as the Xfinity Playoffs. As noted previously, the Chase format was extended to the Truck Series in 2016. The format is identical to that used in the Xfinity Series, except that only eight drivers qualify for the Chase (instead of 12 in the Xfinity Series) and only two drivers are eliminated at the end of each preliminary round (instead of four in the Xfinity Series). As in both the Cup Series and Xfinity Series, four drivers are eligible for the series title entering the final race. Similar to Cup, starting in 2017 "The Chase" moniker was dropped and is now simply referred to as the Truck Series Playoffs. Although NASCAR frequently publicizes the safety measures it mandates for drivers, these features have historically only been adopted long after they were initially developed, and only in response to an injury or fatality. The impact-absorbing " SAFER Barrier" that is now in use had been proposed by legendary mechanic Smokey Yunick during the 1970s, but his idea had been dismissed as too expensive and unnecessary. Only after the deaths of Adam Petty, Kenny Irwin and Tony Roper in 2000, and Dale Earnhardt in 2001 did NASCAR revisit the idea of decreasing the G-forces a driver sustained during a crash. Other examples of available safety features that were slow to be implemented include the mandating of a throttle "kill switch". The "kill switch" was mandated after the death of Adam Petty, along with the requirements of an anti-spill bladder in fuel cells. Fire-retardant driver suits were required only after the death of Fireball Roberts, who died from complications of burns suffered in a crash when flames engulfed his car during a Charlotte race. Dale Earnhardt was killed after he received massive head and neck trauma from a hard crash in the 2001 Daytona 500. Earnhardt's death prompted NASCAR to require all drivers to use the " HANS device" (Head And Neck Support Device), a device that keeps the driver's neck from going forward in a wreck. In the mid-2000s, NASCAR redesigned the racing vehicle with safety improvements, calling it the Car of Tomorrow. The car has a higher roof, wider cockpit, and the driver seat was located more toward the center of the vehicle.